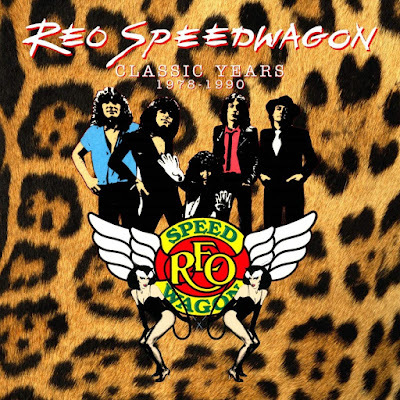 Discussions Magazine Music Blog: REO SPEEDWAGON/The Classic Years (9CDs) reviewed! REO SPEEDWAGON/The Classic Years (9CDs) reviewed! REO Speedwagon’s secret weapon was the musical tension between Cronin’s Pop leanings (the man could write a hook!) and guitarist Gary Richrath’s harder edged approach to writing and playing. On the surface, it is hard to pinpoint the band’s influences. They certainly weren’t trying to be the new Led Zeppelin or Beatles nor did they fall anywhere in between. It is easier to spot a Jerry Lee Lewis influence before anything resembling those two Rock giants. On the other hand, by the time these albums were recorded, they had worked out all the kinks and had their own thing going on. And what was their own thing? REO was and is definitely a Rock ‘n’ Roll band with an accent on Pop but you’ll also find Hard Rock, Country, Folk, and Soul in the mix. Regardless of their influences, REO always sounded like they were having a good time making music. Theirs is a catalog free of pretentiousness and full of melodic hooks. Give some of these songs to Fountains Of Wayne or The Knack and Power Pop fans would be in heaven. All the hits are here: “Keep On Loving You,” “Roll With The Changes,” “Can’t Fight This Feeling,” “Time For Me To Fly,” “Take It On The Run,” “One Lonely Night,” “That Ain’t Love,” and many more. The real meat in this box is the deep album cuts that show off different sides to REO. From FM radio favorites like “Shakin’ It Loose” to lost Pop nuggets like “I Need You Tonight” (which could have been a Bangles track! ), there’s so much to rediscover in this set. Richrath’s guitar playing was always emotionally charged – every note he played meant something. His leads should be studied – he was one of the few Hard Rock guitarists that rarely over-played. And vocalist Cronin possesses a voice that can attack a Hard Rock song and lovingly embrace a ballad. And with a perpetually cheery outlook (at least in public), he most certainly can teach the new rockers a thing or two about tunes and attitude. And let's not forget all the other great REO members, each of them integral to the band's albums contained in this set: Neal Doughty (keyboards), Bruce Hall (bass), Alan Gratzer (drums), Dave Amato (guitar) and Bryan Hitt (drums). While albums like NINE LIVES and GOOD TROUBLE were not as successful as the albums on either side of them, that is not because they lack good songs. Perhaps it was all about timing and there were plenty of like-minded bands occupying the charts at the time. Whatever the case, they certainly need some extra love and attention. THE CLASSIC YEARS contains songs that are stone-cold FM and AM radio classics and much more worthwhile music. I’m glad I learned the error of my close-minded ways nearly 40 years ago because I have been enjoying REO as much as all the bands that are seemingly ‘cooler’ to like. But I don’t mind if people think I’m terminally unhip… because I get to listen to all the good music!